Steve Hackett says he was at this show. Genesis played the next night here. The Lamb Lies Down on Broadway tour. The interview in on youtube. He's talking to Chris Squire. Steve Hackett says he was at this show. Genesis played the next night here. The Lamb Lies Down on Broadway tour. 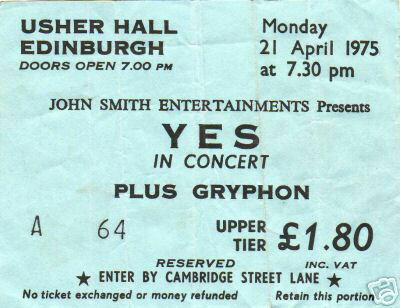 This was the first time I had gone to a Yes concert, though I'd been a fan since first hearing Time and a Word in 1970. Marvelous evening, what I can remember that is ! What I DO remember (because I wrote it down) is that the set list was the exact same as the previous evening.